The Shenedehowa Nordic Club’s Bill Koch Youth Ski League (BKYSL) program meets every Tuesday after school at 3:45 pm in Koda’s room 711. The main purpose of the club is to get our youth out to enjoy the winter months on snow. Parents are welcome to come along to enjoy the fun and games. We also occasionally meet on the weekends to practice on hills or share fun with other Bill Koch Youth Ski Clubs in our area. If you would like more information e-mail me. 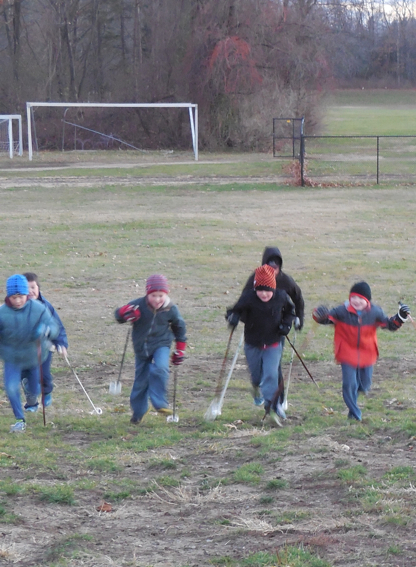 Our Youth Program is the perfect way to introduce Nordic (cross- country) skiing to children aged 4 to 14. Established in 1990, the Shenendehowa Nordic Club’s Bill Koch Youth program has taught dozens of area children and their families the simple skills needed to love cross country skiing, and provided the basics for pursuing Nordic ski racing, or just plan fun on snow. Our club is one of about a dozen clubs throughout the Mid Atlantic region fully sanctioned by the N Y State Ski Racing Association – Nordic, Inc. Contact me by e-mail or call 518-371-7548 for more information. Our Club has always been represented by Shenendehowa youth at the Mid Atlantic Bill Koch Festival held at the end of the season. To the left Aaron meets Bill Koch several years ago as he receives a bronze medal. This year we hope to have a half dozen youth at the Festival in the Adirondack foothills of Saratoga County and each came home with a collection of medals and/or ribbons and many memories of good times with other youth throughout the Northeast. Fun on Snow. If this sounds like fun to you join us any Tuesday after school at Koda Middle School.